Ecology: Study of the distribution and abundance of organisms, the flows of energy and materials between abiotic and biotic components of ecosystems. Study of the distribution and abundance of organisms, the flows of energy and materials between abiotic and biotic components of ecosystems. 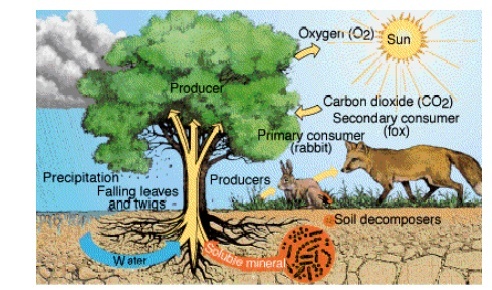 The living things in a given area, non-living chemical and physical factors of their environment, linked together through nutrient cycle and energy flow. Ø Environment is derived from the French word Environ which means to encircle or surround. Ø Environment is sum total of water, air, and land, inter-relationships among themselves and also with the human beings, other living organisms and property. The above definition given in Environment Act, 1986 clearly indicates that environment includes all the physical and biological surroundings and their interactions.